Yesterday I was shopping in Beverly Hills and I stumbled across this. No your eyes don’t deceive you. 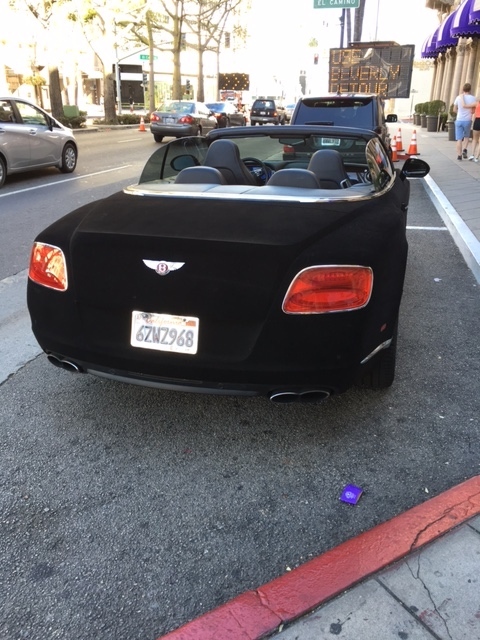 It’s a Bentley, covered in velvet, and it was parked in front of the Beverly Wilshire Hotel attracting all kinds of attention. The comments on my Facebook page ranged from “Sweeet” to “Whattttt? !” to “Why”? But I’m curious to know what you think? I can bet your bottom dollar that when somebody got the idea to cover that car in velvet—a baby blue version is also available for the googling—the response was sure, you bet or why not? Plenty of time to figure out the how later! We all have our definitions of living luxuriously but technically it means the state of great comfort and extravagant living. Since design is a luxury service, it’s your job to figure out the experience that will make your services feel like luxury to your ideal client and provide them. If you’re in the habit of being cheap with yourself though, you’re unlikely to attract a client who is going to let you dream and spend on their behalf, especially if you’re judging the way they’re spending. That car may seem outrageous and although it’s expensive, for the right client, it’s just a number, a number that is worth what’s on the other end of the exchange. What’s yours? What Are The Real Effects Of HGTV and Houzz On The Design Industry?